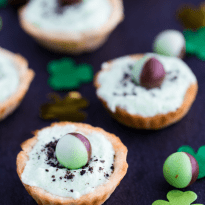 I’ve been using my new Wilton Mini-Tart Pan a ton lately and this past weekend made a yummy St. Patrick’s Day dessert, Grasshopper Tarts, with it. I think I have the crust down to a science now so expect several more tart recipes in the coming weeks. Pillsbury Refrigerated Pie Crusts are perfect for tart making. I use a mason jar with a wider opening (about 3 inches) to make my circles to fit the tart pan. The filling is melted marshmallows, whipped cream and peppermint extract. I added some green food colouring so it would look the part, too. On top is a sprinkle of crushed Oreos and a Aero Peppermint Bubble. I was talking to an American friend about the recipe and she has never heard of Aero chocolate before. I had forgotten that it might not be in all countries! If you don’t have them where you live, just leave them off or add a piece of mint chocolate that you have available where you live. No biggie! If you are REALLY keen on trying Aero and you live in the USA, I found some on Amazon. Looks like they are shipped from England where the brand originated. Canadians, I found them in the chocolate aisle at the grocery store! 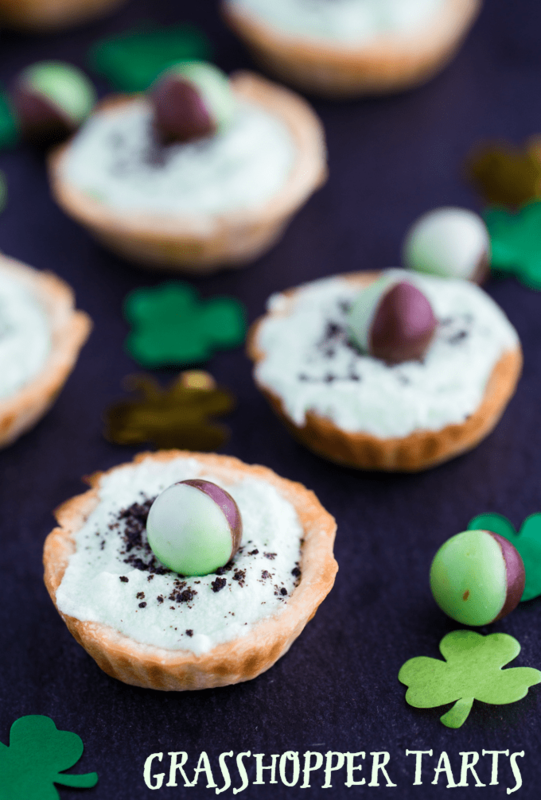 Serve these minty desserts at a St. Patrick’s Day party to celebrate the occasion or just because. It’s always a good time for a delicious dessert! For more St. Patrick’s Day sweets, check out my St. Patrick’s Day Marshmallow Pops, Rainbow Bark, St. Patrick’s Day Dessert Round-up and St. Patrick’s Day Truffle. Have you made Grasshopper Tarts (or pie) before? Minty sweet and green! It’s the perfect St. Patrick’s day treat to serve to friends and family. Preheat oven to 450F. Roll out your pie dough and cut into 12 3-inch circles. I used a mason jar with a wide top to do mine. You will need to reroll the dough scraps as near the end to get the 12 circles. Press dough circles into a mini tart pan. Poke each tart with a fork. Bake for 5 minutes or until golden brown. Note: these bake very fast and burn quickly! Remove tart shells from oven and cool on a wire rack. Melt marshmallows and 1/4 cup whipping cream in a large saucepan on the stove over medium heat. Stir constantly until marshmallows are completely melted. Remove from heat and stir in peppermint extract. Transfer marshmallow mixture to a metal bowl and place in the fridge while you make the rest of the recipe. Add 1 cup whipping cream, powdered sugar and vanilla extract to a large bowl. Beat on high until soft peaks form. Add in food colouring and blend together. Stir in marshmallow mixture to whipped cream mixture until combined. Fill each tart shell with a spoonful of the mixture. Sprinkle on chocolate cookie crumbs and top with an Aero Peppermint Bubble, if desired. 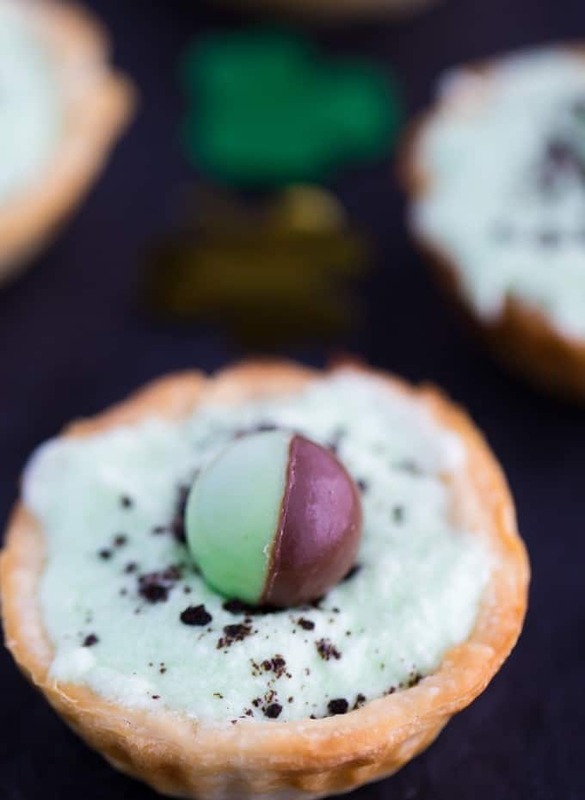 These tarts are so pretty and a really good dessert to make for St. Patrick’s Day. I really like how easy they are to make. This is such a gorgeous dessert. I just love it! These are so cute. I’d love to make them with my grandchildren. Thanks for the recipe. I was trying to find a dessert to make for St Patrick’s Day and I think this would be perfect! These sound really good, my hubby loves mint so he would gobble all these up in no time at all!! Those are very fun and perfect for St. Pat’s day. The tart pan would be nice to have. These would be PERFECT for St. Patrick’s Day! Thanks! I think these would be way too sweet for my taste but my grand kids would love them! This Grasshopper Tart sounds delicious. I am also here to get points to try to win The Immortals Prize Pack. These are so cute and pretty (and of course delicious because what’s not to like about this flavor combo?). Thanks for sharing! YUM! These look delicious! Thanks for linking up to Link Party Palooza! Hope you’re having a great weekend! What a great recipe! I love Grasshopper Pie! These little ones are so cute! Thanks for sharing at Celebrate It!